This article is dedicated to the memory of its late author Aaron Green. Hey, motorcycle enthusiasts and ET bracket drag racers! It is no secret that local motorcycle ET bracket drag racing has taken a beating in the last 5 or 6 years or so. It is 2011 now, and motorcycles are as popular now in the United States as they have ever been. Riding motorcycles is fun and exciting! More street bikes on the highways and byways of America should equal more ET bracket motorcycles at the local drag strip on Saturday nights, but it has not. Why? Perhaps we should figure out the reason for that…….. 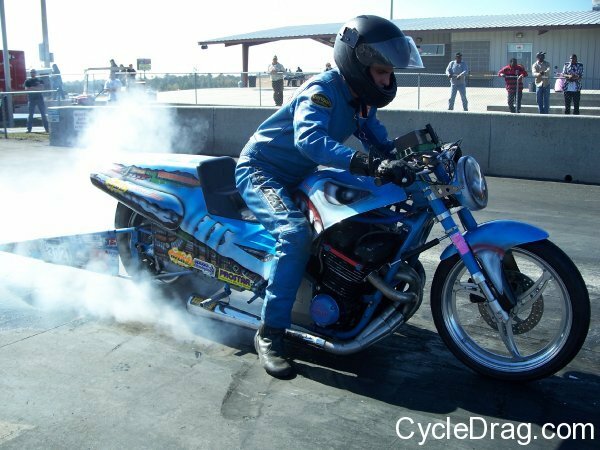 Recently, with the demise of the AMA Dragbike deal, there has been nobody really “steering the boat” when it comes to motorcycle ET bracket racing, outside of the MIROCK Series. Now Jay Regan of M.R.E. (Murdoch Racing Enterprises), did “come to the rescue” with some other people in the motorcycle industry last November, with the Manufacturers Cup race at Valdosta, Georgia. That race did run ET bracket motorcycles with a good field of competitors in attendance. However, that was just one race. Jay Regan is a smart guy, I’ve know him for years, since back when Mike Murdoch was alive, and Jay has a pretty good track record over the years of being involved in successful business deals. The two scheduled Manufacturers Cup races at Valdosta will probably do well in 2011, just like the inagural race did this past November of 2010. What local motorcycle ET bracket drag racing really needs though, is a “grass roots” effort. That is where you come in. That is where the……….”Stand up and be Counted” line comes from at the start of this article. There are only so many guys like Jay Regan in this world of ours. He is busy running his own company (M.R.E.) during the week. 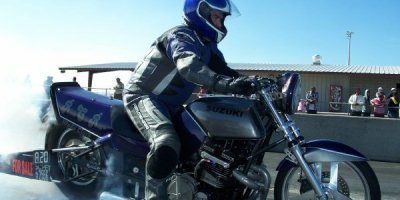 If you like racing bikes, you can help motorcycle ET bracket drag racing in your local area by getting involved. Talk to other bikers at your local “bike night”. Get together with other racers in your local area. Talk to your local race track operator. Track operators all want to make money. If you and your friends can show them a plan to help them generate more revenue on a regular basis by running a bike class, odds are they may be interested. Talk to one of your local motorcycle dealers and get them invovlved. Many motorcycle dealers have access to co-op money from the manufacturers, and most motorcycle dealers are easy to deal with. You may come up with a dealer to sponsor your class, or races, or provide trophies, etc. Many tracks have reduced local motorcycle ET bracket drag racing to either non-existent now days, or if they do run bikes, odds are they run for a low ball, “percentage of entries” based purse. I’ve worked at drag strips all over the United States over the years. Most drag strip operators in this Country are what I call “car guys”, not that there is anything wrong with “car guys”, it is just the truth. Only a few track operators really understand motorcycles, and motorcycle racing people real well. Most “car guy” track operator types are way more concerned about how many Super Pro ET cars they get to show up at their track each week, and since bike counts have dropped off over the years, “car guy” track operators have cut the purses for bikes, or canned the classes all together. As a result less bikes have been showing up at local tracks. 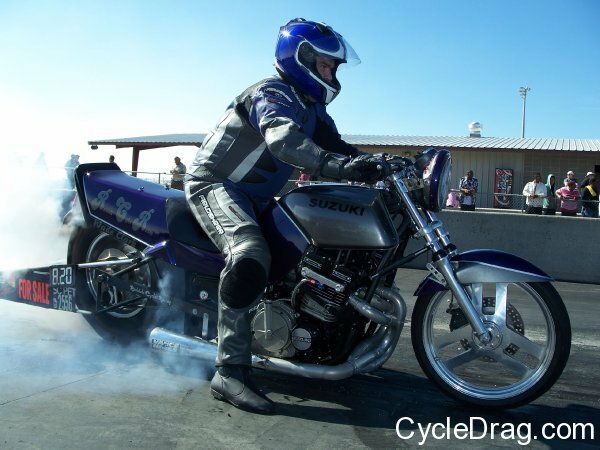 So if you want to be able to “have a place to race”, get off the couch, get together with your local drag strip operator and see what can be done to give local motorcycle ET bracket racing a “shot in the arm” in your neck of the woods. With the number of street bikes on the road today, there are plenty of potential customers for the tracks. Run a street bike class, stay away from delay boxes, automatic shifters, and the like. Make it affordable, you don’t have to run a purse that pays all the money in the world, pay a reasonable amount, and keep the entry fee reasonable. Make it so Joe Average off the street can have some fun and have a shot at going some rounds, and maybe even winning! C.J. “Pappy” Hart ran the first organized drag strip in the United States back in 1950 at Santa Ana, California. I used to work with “Pappy” at NHRA several years ago. That man had forgotten more about drag racing than most people will ever know or learn! He basically invented ET bracket racing for “class car” guys that could not qualify at Lion’s back in the mid 1960’s. “Pappy” always talked about the “little guy”. He used to say this……..”without the little guy you’ve got nothing”. He was right on the money! Larry McBride did not start out on a Top Fuel Motorcycle, Don Garlits did not start out in a Top Fuel Dragster. Nowadays McBride and Garlits are “household names”, everybody knows who they are. It all gets back to the “little guy”. That “guy” may be a “little guy” today, one day he may be a “giant” in the sport, say next year, or 5 or 10 years down the road, That “little guy” just needs a place to start. Trying to do our part out West… check us out online at http://www.westernmotodrags.com. speakin of little guys whos that on the shark bike in the photo of the article?Nice article we need to all do what he says and promote our sport. The Shark Bike is one mean machine…. You woud think that with all the sport bikes out there there should be plenty of racers at the track Sat night. The problem is most just want to go fast, not compete. We need to reach out to these people and show them the ropes. Ecourage your lacal track to offer a street bike class and lets pitch in. Sportsman racers are the backbone of drag racing, two wheels or four, it’s all about getting involved and having fun. Until motorcycle drag racing starts growing it’s own, the sport will never grow to it’s potential.